We’d cleared the wobbly table of its stacks of homework, books, binders, and notebooks, piling them into a corner of the living room. We’d also shoved the mousetraps a bit farther under the fridge. Still, the place didn’t exactly exude romance. My college roommate, Jamie, and I had decided to celebrate Valentine’s Day together that year, inviting our boyfriends to dinner at our off-campus apartment at the University of Wisconsin-Madison. We hadn’t eschewed the typical candlelit meal for two because of some deep-seated hatred for the holiday or animosity toward love—no, the four of us were pretty neutral on Valentine’s Day, and we were definitely ardent supporters of love. The decision was mostly influenced by the fact that we were broke college students. For ambience, we had a drafty kitchen that let in winter, and the thumping and thudding from the guys upstairs, who seemed to turn into 600-pound gorillas the second they walked through their door. But on that Valentine’s Day, the most important thing was that the rickety, drafty table should somehow accommodate four. Jamie had a late class that day and my boyfriend, Mike, had to work until early evening, so it was just Jamie’s boy chum, Brian, with me in the kitchen. He and I didn’t mind. The four of us had collaborated on a menu in the previous couple of weeks, flipping through our limited stash of cookbooks and clicking around food websites until we hit on the ideal mix of inexpensive, tasty, and simple dishes. At the time I’d thought one ingredient to be terribly exotic: rice wine vinegar. I’d never even heard of the stuff. Luckily, I’d found it at Trader Joe’s across town earlier that week. And bless that Joe, he’d also supplied us with a couple of other crucial components, including frozen chocolate lava cakes, ready to pop in the oven as soon as the entrée had cleared out, and wine cheap enough that we could buy a liberal amount. The pièce de résistance was roast chicken with spinach and ricotta stuffed beneath the skin. The recipe sounded marvelous, although once we began cramming the dark spinach and the white cheese beneath the thin layer of chicken skin, the mixture gave the bird a bizarre, mottled look that suggested an unfortunate dermatological issue. No matter. Into the oven it went. Undeterred, we continued with the makings for the rest of the meal. As Brian and I sliced and diced and basted and deglazed, we had to run to the computer to check a few techniques and ingredients. Exactly how many millimeters wide is a “fine chiffonade“? What’s safflower oil, and could we use canola instead? But for the most part, things went off without a hitch. Our expectations were buoyed by the fact that the chicken was taking a tantalizing olfactory romp through our apartment as it roasted. And Brian and I took more than a few opportunities to sample the wine, getting giggly on our shamelessly indulgent pours. Our Significant Others arrived within a few minutes of each other, stomping snow from their boots and shaking it from their hair. As penance for showing up just as the work was done, we tasked them with setting the table—and with dish duty after the meal. No small task, considering the copious pots, pans, and bowls that were stacked in the sink. Our least-stained tablecloth was flung over the table’s rickety surface, and from our mismatched collection of dishes and flatware, they produced four settings. There weren’t enough candles to create proper mood lighting, although it felt inappropriate to leave the overhead lights on, so we made do with a hodgepodge of flickering half pillars and tail ends of tapers. 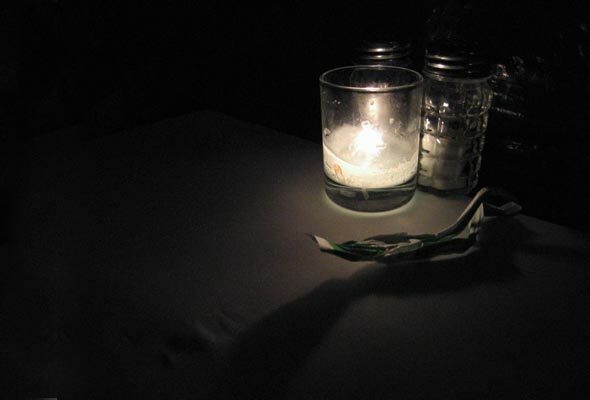 Then we set out platters of chicken, vegetables, salad, baguette, and butter, and settled around the table in near-darkness. It took a while for our eyes to adjust to the ridiculous dimness, but when they finally did, we dug in and chattered away. As we cycled through the meal—pile food on plate, fill glass with wine, eat, drink, repeat—our conversation was of the utmost significance. We speculated about whether the creepy taxidermied antelope head in the basement was still wearing the Dora the Explorer party hat we’d put on it the previous Halloween. (We were too afraid to actually check.) Jamie, an aspiring elementary school teacher, regaled us with the day’s adventures in student teaching, which involved a particularly talented third grader who managed to tie himself to his chair using nothing but his shirt. Forkfuls of chicken and vegetables were punctuated by clatters, shouts, and the sounds of rolling chair races from the guys upstairs, leading the guys around our table to launch into unkind impressions of what primate life must be like up there, in turn sending wine shooting through my and Jamie’s noses. Eventually, someone noticed that we’d forgotten about dessert, so we pulled the chocolate lava cakes from the freezer and popped them in the oven. By then we were far from hungry, but we figured a Valentine’s Day without dessert was just plain wrong—sort of like a solo career from a Spice Girl. I’m sure they were gooey and chocolatey and quite decadent, although honestly, I don’t really recall much about the food that night other than the making of it. I’m sure the dinner tasted fine—it may have even been good, for all I know—but my lasting memory from that night is the incomparable blur of cooking, friendship, and laughter. Sure, I could’ve successfully celebrated all those things with just my boyfriend, who’s since been upgraded to husband. But five years, four apartments, and two cities later, that night remains, without a doubt, my most memorable Valentine’s Day. Despite the chill, the racket, and the mountains of schoolwork, it was pretty close to perfect. When it comes to food and love, I’m of the more-is-more philosophy. Photo © 2006 ultrahi. All rights reserved.